Come winters and the shops are full of goodies like revri, gajak and chikki. They are relished very much in winters. People huddle around the bonfires and enjoy them. The main ingredient of these goodies is the sesame seeds known as til in Hindi. Besides titillating the taste buds, sesame has great health benefits. Sesame seeds are tiny, flat, and oval with a distinct sweet nutty flavour. The seeds are white, black and brown. Sesame seeds are an excellent source of calcium, magnesium, iron, zinc, manganese, phosphorous, Vitamin B1 (thiamine), healthy protein and fiber. Half a cup of sesame seeds with hull contains three times more calcium than half a cup of whole milk. Sesame is widely consumed in the hills during winters. It is incorporated in the diet in a number of ways. A lot of sweet preparations are made during Maker Sankranti using sesame. 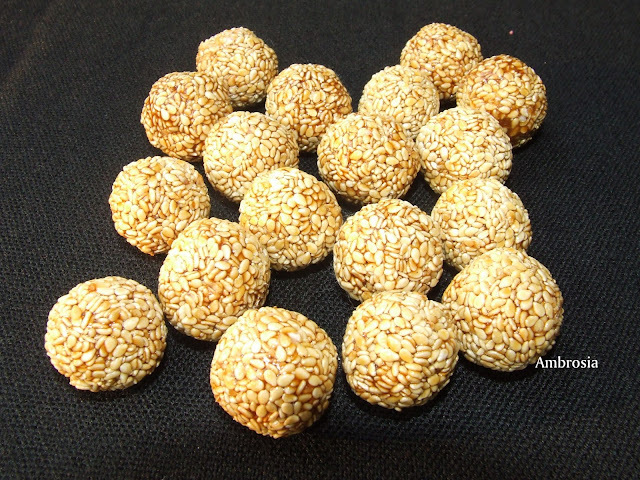 One of the most popular way of having it regularly is by making sesame balls (laddu) using jaggery. My Grandmother had arthritis and she used to make them regularly during winters. Sesame seeds are a very good source of copper. Copper provides relief in pain and inflammation associated with rheumatoid arthritis. 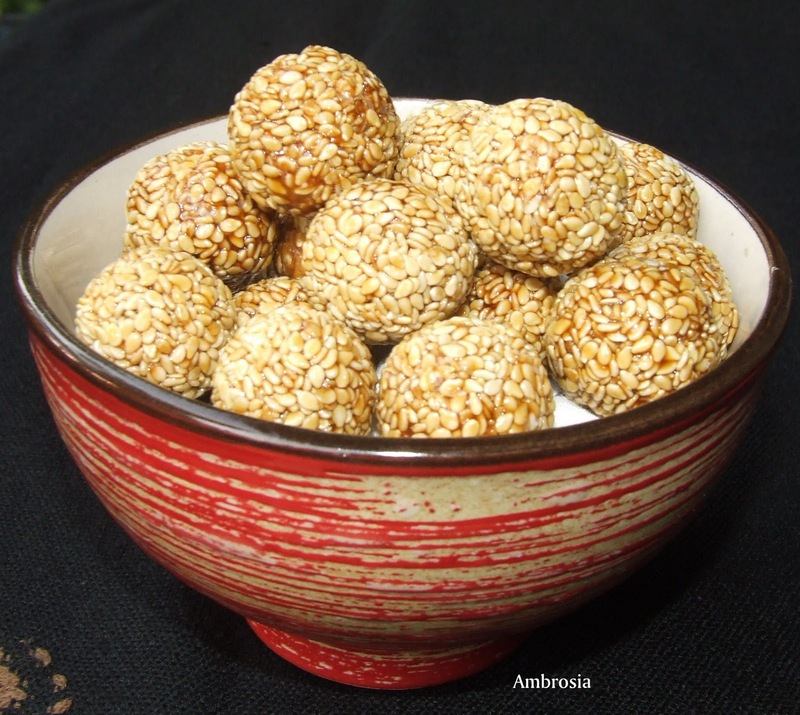 Easy to prepare and easy to store, these laddus are very nutritious and tasty. Perfect to satiate sweet cravings after food and for healthy snacking. Add roasted sesame seeds. Mix well. Let the mixture cool. My Notes: Whatever quantity of sesame seeds you take, the quantity of jaggery will always be half the quantity of sesame seeds.